CEBUANO junior cyclist Luis Miguel “Igi” Maximo will try to defend his overall junior ranking when the 5th leg of the prestigious 2010 Philippine Premiere Cycling League championship series kicks off today in Paranaque City , Manila. The 15-year-old student of Springdale School will face an acid test as the 5th leg will be a tough 30 kilometer Individual Time Trial (ITT) set at Macapagal Avenue in Paranaque City near the SM Mall of Asia. Maximo, who is supported by Oz Racing and Maximax Air Conditioning, earlier admitted that ITTs are not his forte and said his chances today may not be very promising. “Not promising. ITT event is difficult for me. I don’t get to practice it because we don’t have many ITT races in Cebu . Second, this is a forte for triathletes, and I am not (yet). I know I will be up against some of the best junior tri in the country. Third, my bike is not ITT-ready. It’s a road bike that we have to modify so that I can use it for an ITT race,” Maximo said. 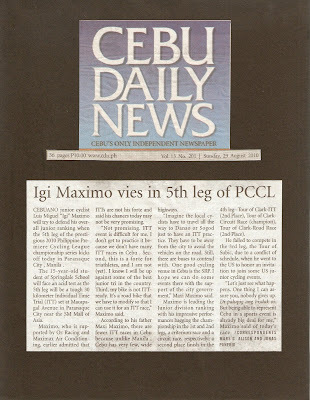 According to his father Maxi Maximo, there are fewer ITT races in Cebu because unlike Manila , Cebu has very few, wide highways. “Imagine the local cyclists have to travel all the way to Danao or Sogod just to have an ITT practice. They have to be away from the city to avoid the vehicles on the road. Still, there are buses to contend with. One good cycling venue in Cebu is the SRP. I hope we can do some events there with the support of the city government,” Maxi Maximo said. 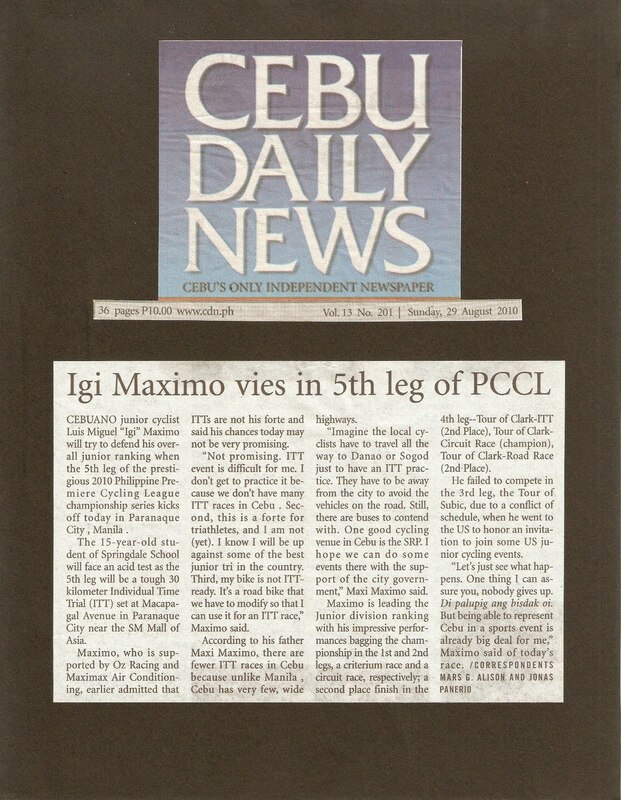 Maximo is leading the Junior division ranking with his impressive performances bagging the championship in the 1st and 2nd legs, a criterium race and a circuit race, respectively; a second place finish in the 4th leg--Tour of Clark-ITT (2nd Place), Tour of Clark-Circuit Race (champion), Tour of Clark-Road Race (2nd Place). He failed to compete in the 3rd leg, the Tour of Subic, due to a conflict of schedule, when he went to the US to honor an invitation to join some US junior cycling events.